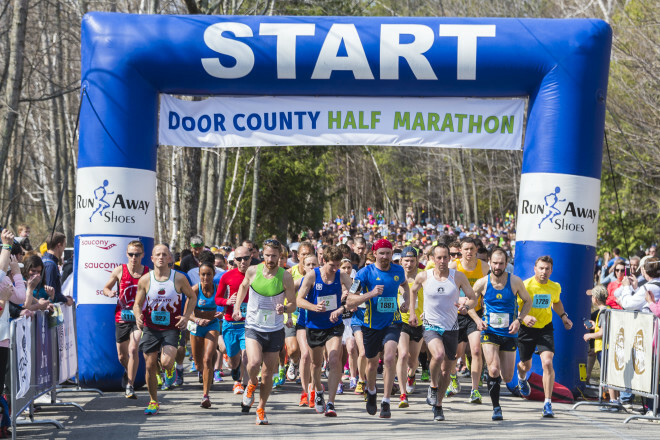 2015 Door County Half Marathon start line. More than 2,500 runners take on the race each year. Photo by Len Villano. We’ve made your planning easy with this guide to getting active with 2017 Door County runs and rides to check out. If you want plan to take on many runs, consider signing up for the Run the Door race series. Door County has become a hotbed for silent sports competition and experiences. Whether you want to test yourself in a 5k, step up to a half marathon, or push yourself to tackle a swim, bike and run for 70 combined miles, you can find your challenge on the Door Peninsula. 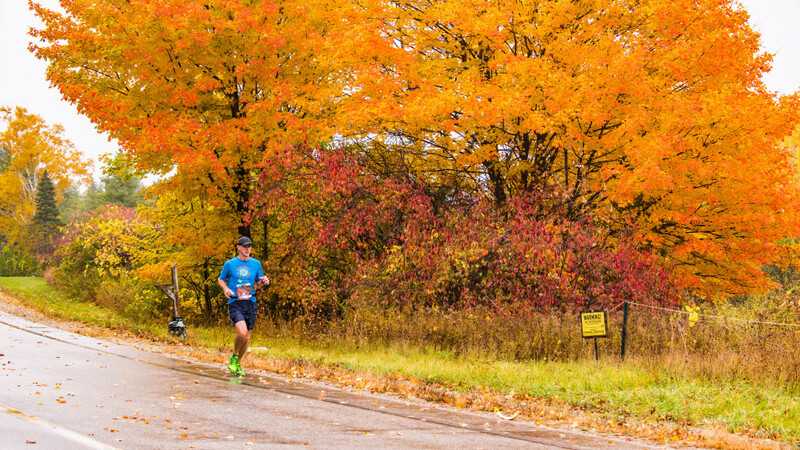 Hailed as one of the best runs in the Midwest, the Door County Half Marathon includes “13.1 of the most scenic miles you’ll ever run,” according to Jenny Hadfield of Runner’s World. Enjoy a USATF-certified closed road course that takes you along the shore, through the woods, and atop the bluffs of Peninsula State Park. Finish with beer and friends at Nicolet Bay. 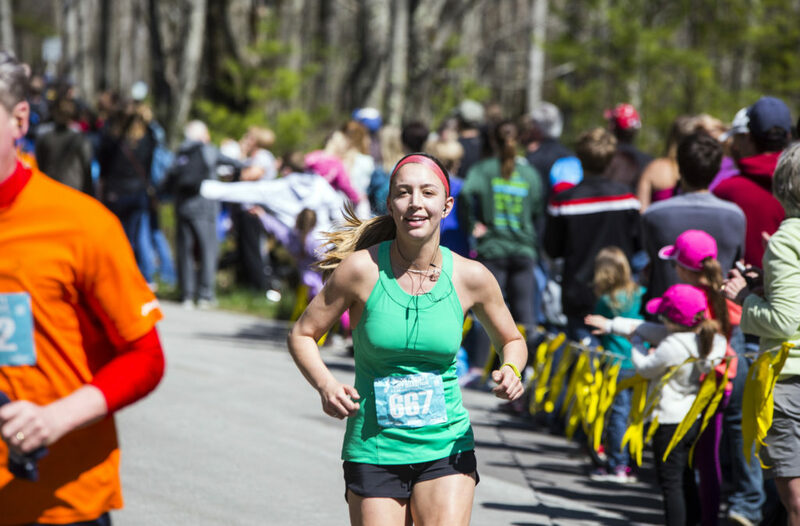 The Door County Half Marathon has become a community-wide celebration each May. Photo by Nate Perry. 5-mile and 2-mile run along Whitecliff Road. 50 mile relay run from Sturgeon Bay to Luxemburg on the Ahnapee Trail. 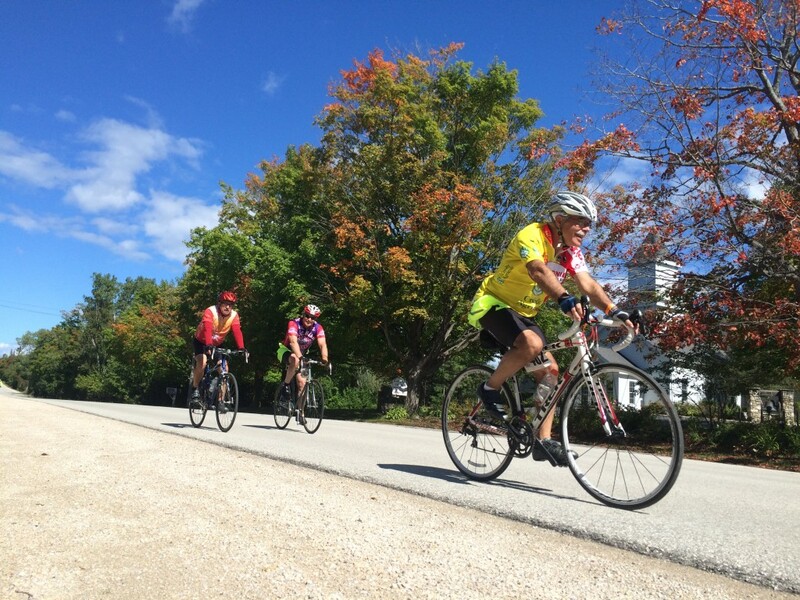 100, 62, 50, and 25-mile bicycle rides through rural countryside and shoreline vistas of northern Door County, ending with life music and a buffet from local chefs at the grounds of the Door County Beer Festival. Peninsula Century Spring Classic bike ride ends at the Door County Beer Festival. Photo by Len Villano. 10k, 5k, and 2k trail run through the woods, meadows, and orchards in and around Crossroads at Big Creek. 5k run/walk to kick off the 4th of July celebration. 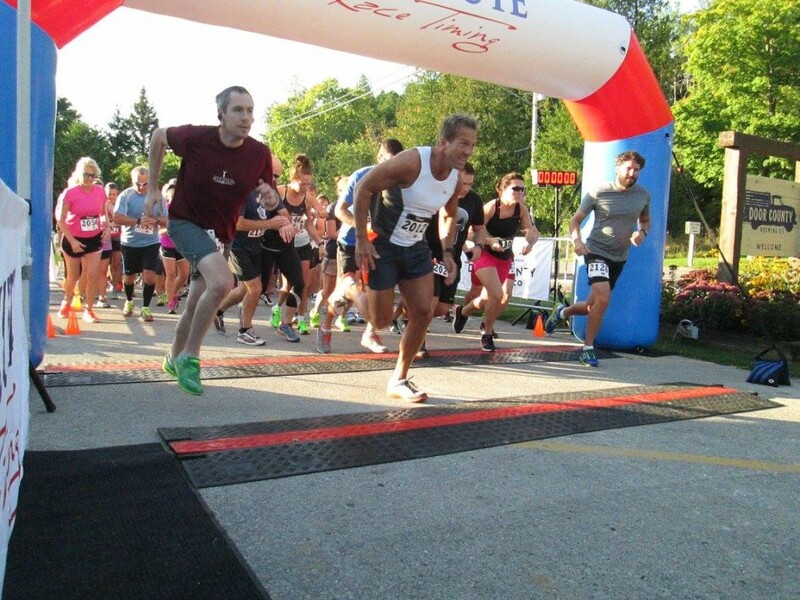 Door County’s largest 5k run. 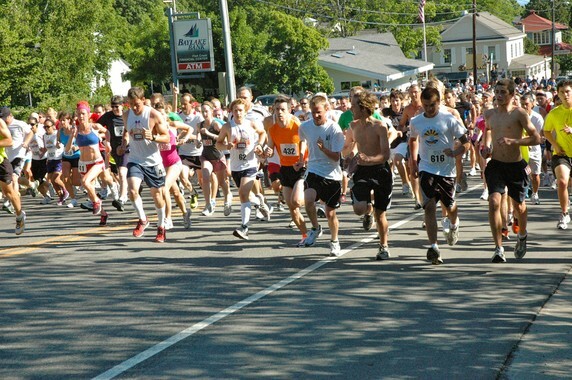 A thousand runners will toe the line at the bottom of the Fish Creek hill on July 4 to participate in the annual Hairpin Run. Competitors hit the water at the Door County Triathlon. 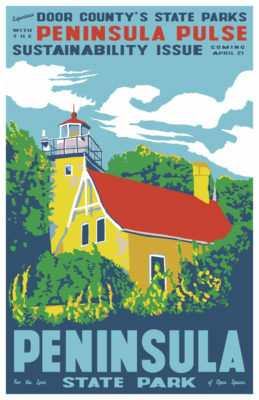 100, metric century, 50, and 25-mile routes through northern Door County’s most scenic roads. Century route includes King of the Hills challenge featuring three climbs and prizes in multiple categories. Ends with live music, buffet from Sister Bay chefs, and Door County Brewing Co. beer at Sister Bay’s Waterfront Park. The Peninsula Century Fall Challenge features a King of the Hills competition and ends on the Sister Bay waterfront. Photo by Myles Dannhausen Jr.
5k fun run in Baileys Harbor that starts and ends at the Door County Brewing Co. taproom. Get great swag including a pint glass, free beer, and awesome shirt! Runners at the start of the Hey Hey 5k at Door County Brewing Co., Baileys Harbor. Photo by Myles Dannhausen Jr.
50-mile solo and relay run from the tip of the peninsula at Gills Rock to the base at Sawyer Park in Sturgeon Bay. Includes prizes for best team name and costume, and a huge post-race party with pizza and beer.